Yesterday I sandwiched (if you can call it that when there’s only a top and some batting) the Lily Wall Hanging. I used these lovely, small safety pins. I bought them when Sylvia and Louise and I were travelling to Gettysburg. We stopped at a huge warehouse of a place that seemed to sell everything known to man. These small safety pins were sold a quilt basting pins. I really like them. 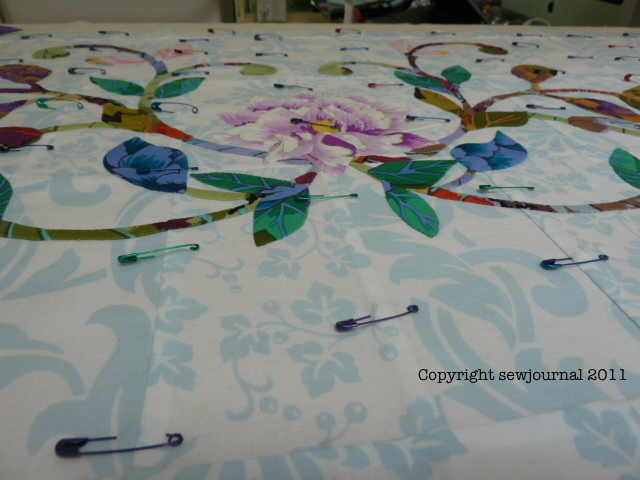 Because they are smaller than the usual pins they are sharper and don’t damage the quilt top fabric. This is the second time I’ve used them and if I ever see them again I’ll get some more because they’re great. I’ve had a bit of trouble deciding what colour to quilt with. This picture shows my available options. I have opted to use two of the Sulky Blendables but this time with small stitches. I’m also using Thread Heaven thread conditioner and it is wonderful. I’ve never used it before but it really makes quilting easy. The threads I’m using are the one on the right and the fourth from the right. I hope to have something to show you soon. Those were exactly my choice too Munaiba. Look forward to seeing it. Why are you quilting it without the backing on? I’m currently sashiko stitching a quilt front I finished a year ago. I’m going to quilt the back on in a different pattern sashiko. A lot of work, but I have done it before and really like it. The front is appliqué on white or bone fabric, and is being quilted in white. The back is in navy blue and ecru and will have japanese red sashiko. Beautiful choices Munaiba. How are you quilting it? I’m guessing all around the applique, but then what? LOVELY!!! No I’m not echo quilting. I’m quilting ripples all across the panel. 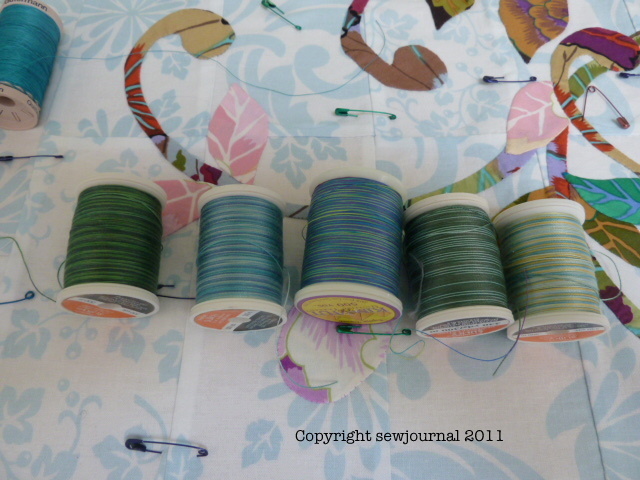 Love the thread choices! I think they will compliment the colors very well. I’m intrigued by the safety pins! Who’s the manufacturer? I’m not sure about the manufacturer. I don’t have the labels anymore.